Giacomo Corleone presenting on "Understanding Genetic and Epigenetic Hierarchies in Cancer for Precision Medicine." 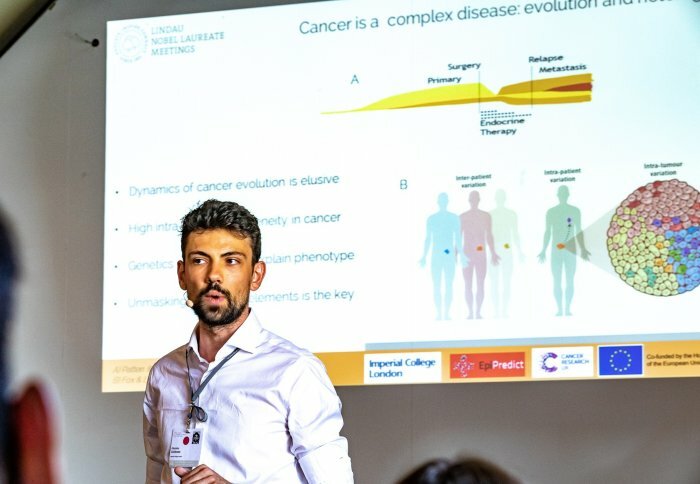 Giacomo Corleone presented to a cohort of outstanding young scientists from around the world at the prestigious 68th Lindau Nobel Laureate Meeting. The meeting took place from 24-29 June in Lindau, Germany, and was attended by 600 students, doctoral candidates and post-docs under the age of 35. 40 Nobel Laureates also took part in the meeting, which was dedicated to physiology and medicine. More than 130 academic partners worldwide – academies, universities and foundations – nominated the candidates for participation after internal application procedures. Established in 1951, the aim of the Lindau Nobel Laureate Meetings is to bring together world-leading pioneers in science with outstanding young scientists from around the world. Giacomo is a final year PhD student in Computational Biology working on Breast Cancer Genetics and Epigenetics. He was 1 of 6 people selected to present at the meeting, where he presented on Understanding Genetic and Epigenetic Hierarchies in Cancer for Precision Medicine, as part of a Masterclass on Advances in Understanding and Exploiting the Genetic Bases of Cancer. Speaking of his experiences at the meeting Giacomo said: The participation in the Lindau Nobel Laureate meeting has been the most rewarding and inspiring experience of my brief (at the moment) academic career. For a week I was surrounded by some of the brightest minds in the world and had the chance to be involved in discussion with people that have the influence to change the way we see the world. I felt as a young scientist to be truly part of a community of people coming from all over the globe, passionate about solving the problems of humanity. The most exceptional experience was being selected to present at a Masterclass. The fact that 2 Nobel Laureates (Prof. Bishop and Prof. Varmus) gave me the chance to present my own research in front of an audience of experts in the field of cancer genetics, is an experience I am truly thankful for. The Masterclass sessions help the students to discuss their own research enhancing the exchange of ideas with the input of the Nobel laureates hosting the session. Prof. Bishop gave a pointed critique of our research and how we presented, this feedback is something I will keep contained in my stock of knowledge for the rest of my life. I left the meeting more motivated to keep working on my research, inspired by the discussion with the other colleagues and Nobel laureates. An exchange that I recommend to any young scientist. Every single minute spent in Lindau will stay with me forever and will be a source of inspiration. In conclusion, I would like to thank the people who funded me and inspired me in pursuing my research. Without my PI Luca Magnani and my colleagues, I would never be selected. 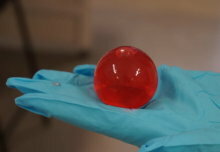 The scientific achievements obtained in the last year are just a result of a teamwork. Then, the Else Kröner-Fresenius-Stiftung which fully sponsored me at the meeting and finally my family who always supported my choices. Giacomo's PhD research has recently been published in nature medicine.